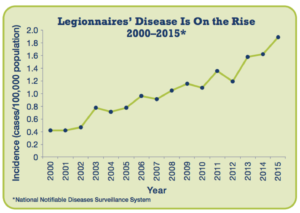 Legionnaires disease outbreaks are on the rise. In fact, according to the U.S. Centers for Disease Control CDC, from 2000-2014 the amount of people with Legionnaires’ disease almost quadrupled. Just as staggering, the CDC notes that according to their investigations 9 in 10 outbreaks were the result of problems that could have been prevented with “more effective water management”. Clearly, action is necessary across the board, from city to state to the federal government. 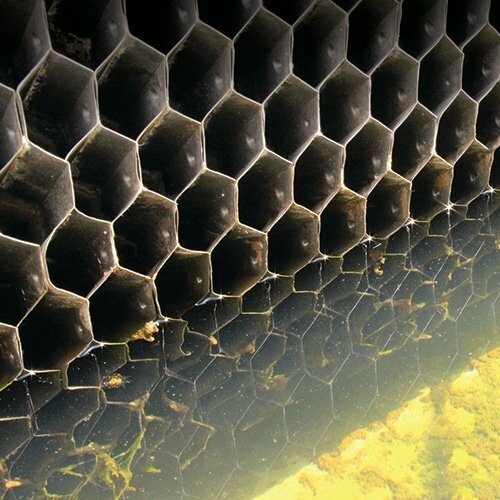 Cooling towers – although complete eradication of Legionella can’t be guaranteed continuously in any given cooling tower, it can be controlled with proper preventative maintenance and tower hygiene, as well as an excellent water management program. Shower heads — can host bacteria growing in water if the temperature isn’t high enough to kill the bacteria. Plumbing in unoccupied floors in building — when a water system goes unused, it provides a bacteria breeding ground. Hot tubs that aren’t properly maintained — the warm water is a ripe bacterial environment to grow Legionella, which the tub’s jets subsequently disperse. Malfunctioning municipal water systems — an interruption of the regular water flow (and the disinfectant chemicals that water carries) can supply the opportunity for Legionella bacteria to take hold. Decorative water fountains — these can disperse the bacteria via water droplets. It’s the building owner/manager’s responsibility to understand the risk areas and to develop a water safety management plan. Such a plan will reduce the risk Legionella can ever get a foothold in the building. Building owners and managers may also have a legal obligation (at either the state or city level) to counter Legionella. New York has been trailblazing a path to enforce legal requirements around Legionella control, setting an example for other health safety authorities. Learn and adopt published standards for Legionella risk management (such as ASHRAE Standard 188). Perform risk assessments on the building water systems to detect any growing Legionella bacteria. 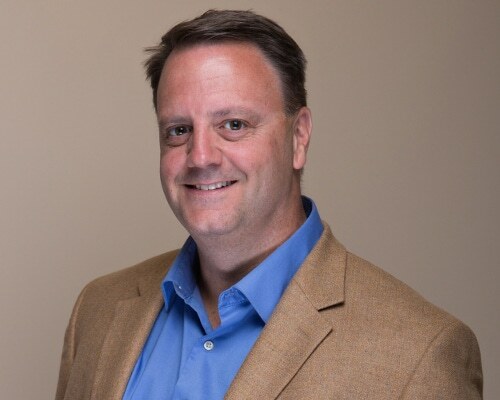 Develop and use a Legionella management program. Periodically monitor and respond to water quality changes. Failure to perform the above tasks may mean you’re in contravention of your local regulations. While codes and laws vary about how to protect water systems, as a building manager/owner, Legionella prevention is still your responsibility. Fortunately, municipal and state officials generally offer guidance for complying with their legislation. For water safety management, for instance, cities offer legislation compliance tools and information for building owners. Often, third party contractors can provide water safety management services, which ensures specialists are on the job. They can conduct a survey or risk assessment on your building. Once you have a risk assessment in hand, you can use it to create a management plan. Why wait for a major Legionnaires outbreak or a city bylaw to act? If you’re worried you have an inadequate water safety management plan — or you lack such a plan at all — it’s time to act. Legionnaires Disease kills ten percent of those who contract it. That should provide all the motivation needed to take steps, if you can, to prevent any outbreaks. A sound water safety management and preventative maintenance plan can help to block your tenants and visitors from Legionella exposure. 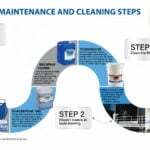 Check out the NY cooling tower maintenance rules/guidelines. 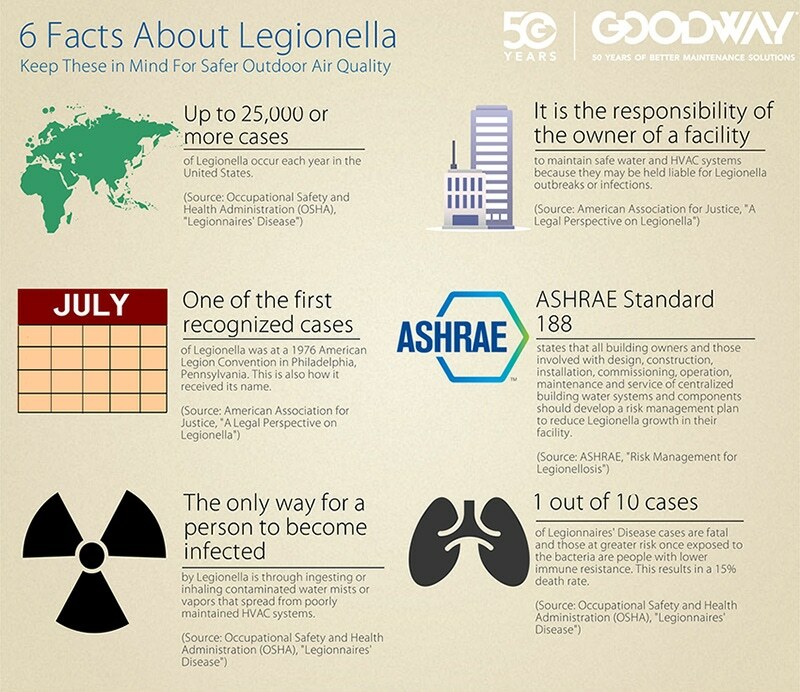 Download Goodway’s 6 Facts About Legionella infographic. Download the CDC’s infographic on how Legionella affects building water systems and people.